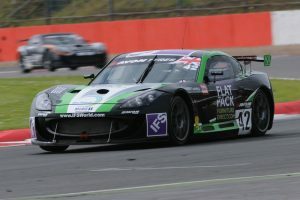 Silverstone’s Grand Prix Circuit played host for round four of the British GT Championship. The Silverstone 500 is the championship’s longest race of the season being run over three hours. Dark skies moved in over the Northamptonshire circuit just ahead of Saturday afternoon’s two part qualifying session. Contesting qualifying one in car #42 was Tom Oliphant with Aleksander Schjerpen in car #43. Rick Parfitt Jnr and Morten Dons would subsequently take over for qualifying two. Both drivers’ fastest times were added together at the end of the second session to determine the starting order for Sunday’s big race. At the end of the two twenty-minute sessions it Rick Parfitt Jnr and Tom Oliphant who for the second weekend in a row secured pole position with Aleksander Schjerpen and Morten Dons in eighth. Glorious sunshine soaked the track for Sunday afternoon’s three-hour race. With a season high 36 car grid it was set to be a thrilling afternoon. 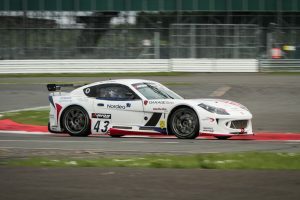 As the race got under way it was Parfitt who set about showing his intentions early on, opening out a ten second gap after just five laps ahead of his nearest nearest GT4 rivals. Schjerpen who started in car #43 had promoted himself to sixth in the early part of the race. After a brief safety car period racing got back under way but almost immediately, Parfitt was passed by the Aston Martin of Jake Giddings dropping him to second place. Rick pitted the car after 50 minutes to hand over to team mate Oliphant returning to the circuit in the class lead. Morten Dons was now at the wheel of car #43 and was running in a strong fifth place after 70 minutes before being promoted to fourth when the G55 of Matt Nicoll-Jones retired. Dons set about closing the gap to third place before returning to the pits to hand the car back to Schjerpen at the half way point. Tom Oliphant quickly followed suit hand the leading GT4 car back to Parfitt. Once the cycle of pit stops had ended it was Parfitt in third and Schjerpen in sixth. A late pit stop from the lead car promoted Rick to second as he was closing in on the TF Sport Aston Martin. A move for the lead going through Becketts resulted in contact causing both cars to spin. Parfitt would suffer a further blow with the Race Director handing him a drive through penalty for his involvement in the incident. With 50 minutes remaining, Aleksander Schjerpen completed the final mandatory pit stop from fourth allowing Morten Dons to finish out the latter part of the race. Soon after taking his drive through penalty, Rick also pitted to allow Tom Oliphant to complete the remainder of their race with 41 minutes to run. What was now turning into a sprint race finish, Oliphant was in his comfort zone closing the gap to third. Just as Tom was lining up to make a move, a small fire developed in the left rear of the car as a result of contact with a GT3 car. Despite continuing for another lap, Oliphant was forced to pit with one lap remaining to have the fire extinguished, ending what was sure to be a podium finish. Morten Dons completed a blistering last stint attempting to reel in the car of Wylie but time ran out before he could catch the Aston Martin. However Morten was promoted to a strong fifth place finish with the demise of Oliphant’s car. Despite not taking the chequered flag Oliphant and Parfitt were awarded eighth in the results.